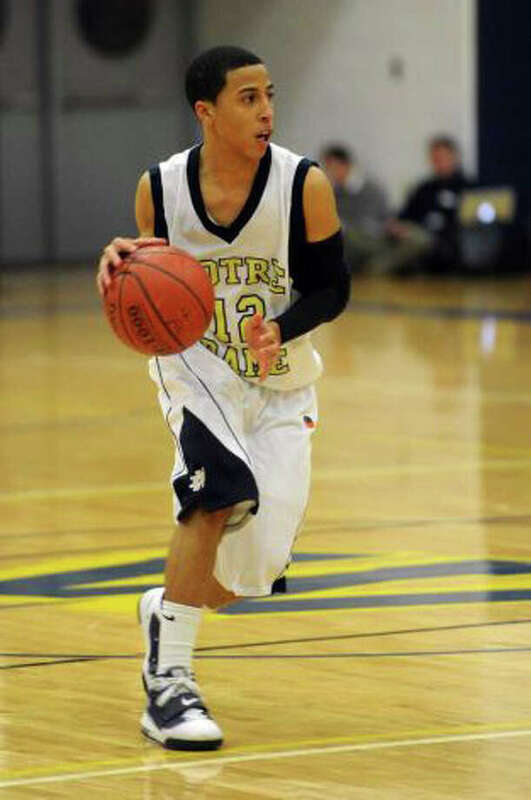 Notre Dame-Fairfield's Tre McPherson will be one of the Lancers' captains in 2011-12. You'd think a 23-4 record, a conference title and a state semifinal berth would satisfy a lot of high school basketball teams. But the ND-Fairfield boys are hungrier than ever for the 2011-12 season. That's because despite dominant up-tempo play and its SWC championship, that loss in the Class M semifinals to eventual champion Trinity Catholic still lingers. "It was a great game," ND coach Vin Laczkoski said. "Unfortunately someone had to lose and it was us." "That haunts us," junior guard Earl Coleman said. The 61-59 overtime defeat to the Crusaders has also motivated ND to keep its foot on the pedal. "We can't let up," Coleman said. "If we take one play off, that could be the one play that decides a game." The Lancers return eight from that team that fell two games short of a state crown. Coleman and Danny Upchurch-- ND's two leading scorers in 2010-11-- are only juniors, and ND's top low-post threat Arkel Miles is a four-year starter and a senior captain this year. "I want to go all out," Miles said. "This is my last year." Miles will be joined in the low-post with Will Clyne and Kevin Laing. The three will be looked to rebound and get the ball into transition to quick guards. "I've got to stay consistent with the rebound," Miles said. "But it's a group thing, we all know our roles." Two of those are captains, as well. Tre McPherson, who averaged 11 points per game, is also a senior captain as is guard Nnamdi Gogoh. expected to see minutes off the bench as ND's veteran coach expects his rotation to be at least 10-deep. "We have trust in our freshmen," Coleman said. "They're going to be good." in the playoffs is impossible. But that doesn't mean ND doesn't realize it has a target on its back. "We're the hunted," Laczkoski said. "We're looking forward to the challenge." Despite the embarrassment of riches ND has, Laczkoski knows that it's up to his team to actually make the most of the year and finish it with another SWC crown and the Class M title. "We're very excited," he said. "But it doesn't matter where you start, it matters where you finish."